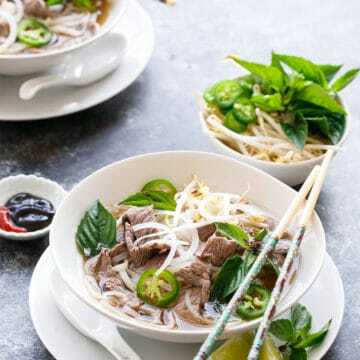 Let me start by saying: this is not real pho. 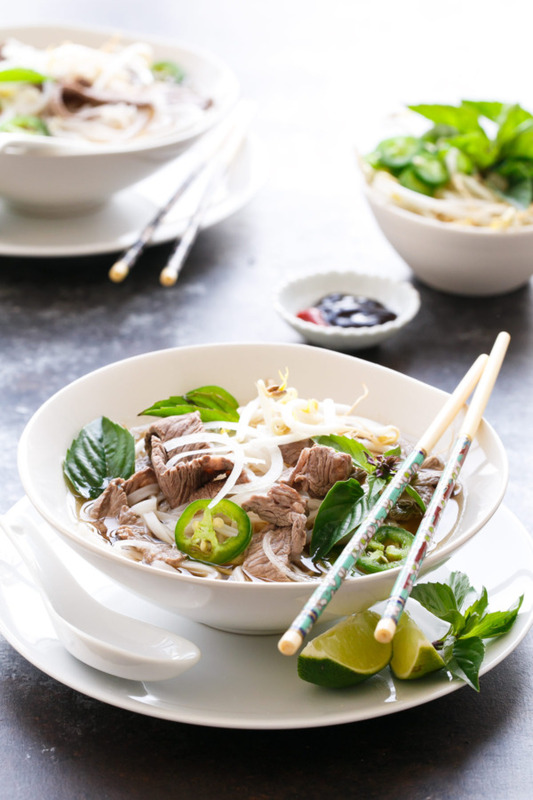 Real pho is a lengthy process that involves gently simmering beef bones, various cuts of meat, charred onions and other aromatics for hours to produce a clear and yet richly flavored and lightly spiced broth. If you’ve never had real pho, I highly recommend seeking out the nearest Vietnamese restaurant and diving into a bowl as soon as possible. Dare I say it is more satisfying than chicken soup? Those spices are everything. Remember that the next time you get a cold. Unfortunately, life is such that we don’t always (or, er, ever?) have six extra hours to spend simmering beef bones to make our own broth from scratch. So, we have to cheat a little bit. 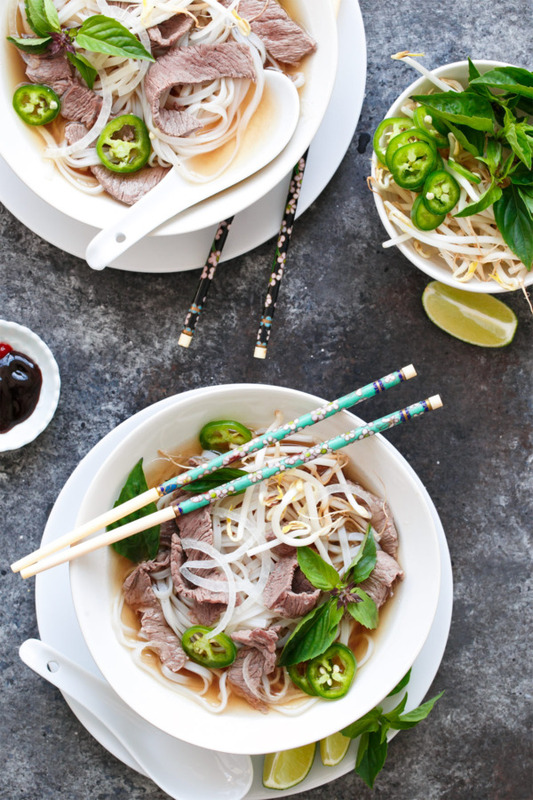 Faux pho, if you will. 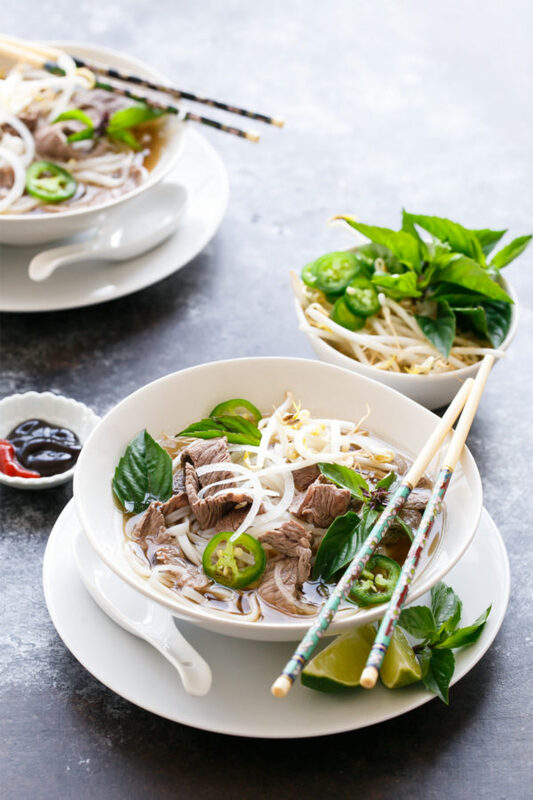 Here we’ve used pre-made beef stock, which we then simmer with some of the same spices you find in traditional pho such as star anise, cinnamon, and cloves. A beautiful tender piece of beef, sliced every so thinly, is added at the very end and cooks in a matter of seconds. It’s all served over a bed of rice noodles and piled high with bean sprouts, Thai basil, onion and jalapeno (as you dare) and accompanied by a small dish of hoisin and sriracha for added flavor (I usually swirl my chopsticks in the sauces and then dive in for a perfect bite of noodle and beef and all the fixings). 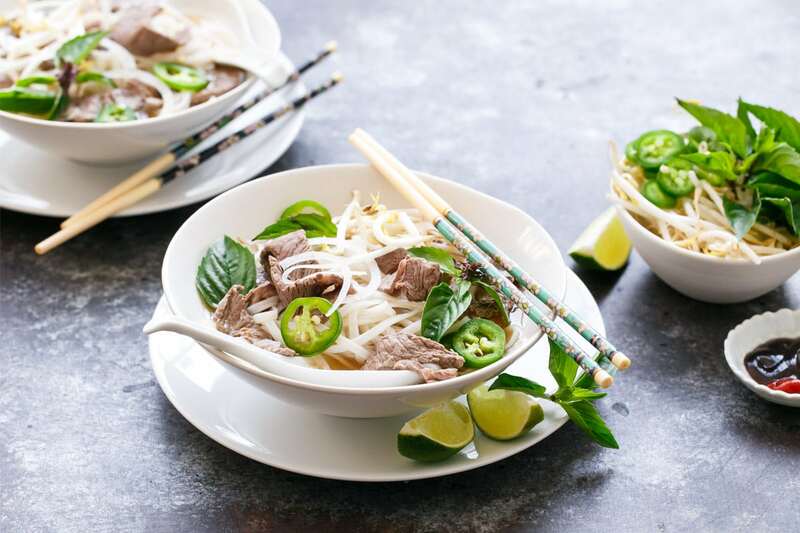 Legit Vietnamese restaurants will serve giant bowls of pho alongside a plate piled high with bean sprouts and fresh Thai basil. Trust me, if you are able to get your hands on some Thai basil, with its purple-tinged leaves and subtle licorice undertone, do it. 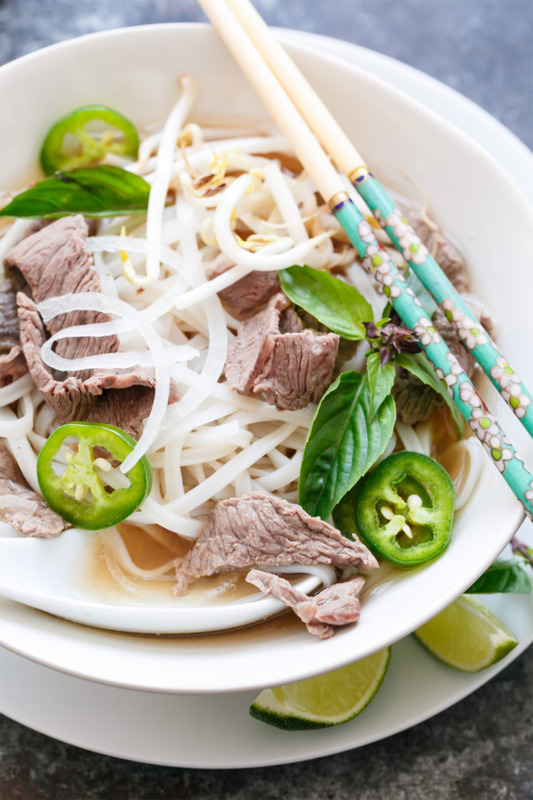 It’ll make your faux pho that much closer to the real deal. Personally I like to grow two kinds of basil in my patio herb garden for just this reason; regular Italian sweet basil, while it will work in a pinch, isn’t quite the same. As far as noodles go, look for medium thick “rice stick noodles” in the International foods aisle of your local grocery store or an Asian market if you have one. They come in varying thicknesses, but something akin to fettuccine is just about perfect. If you see “pho” on the package you’re good to go. Do not cook these like normal Italian pasta; you’ll end up with a gluey mess. We usually boil them for 2-3 minutes and then quickly drain and rinse with cold water. However I’ve also seen instructions to pour hot water over the noodles and let them sit for 5 to 10 minutes, essentially blanching them. The key, either way, being not to overcook them. If anything, slightly undercook them, as the hot beef broth will finish the process for you. 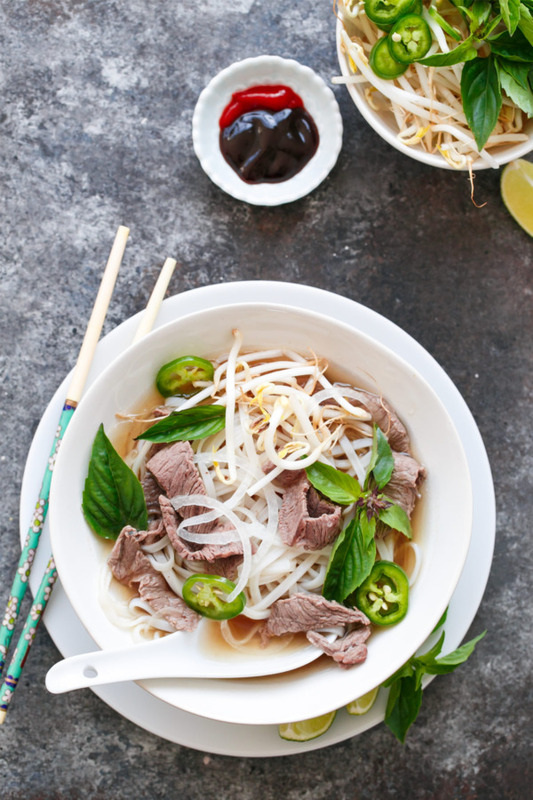 A quick ‘faux-pho’ recipe using pre-made beef broth, simmered with spices. Served over rice noodles with tender, thinly sliced beef, it’s a perfect soul-warming weeknight meal. In a stock pot set over medium high heat, combine beef broth with 2 cups filtered water. If using whole spices, wrap spices in a piece of cheesecloth and tie with a string. You are essentially making a homemade tea bag so you won’t be stuck fishing out whole cloves out of your soup later. Add spices to broth and bring to a boil; reduce heat and simmer for 15 minutes. While broth is simmering, cook rice noodles according to package instructions until al-dente. We boil ours for 2 to 3 minutes, then rinse with cool water.to prevent sticking. Divide among serving bowls (the hot broth will finish cooking them in the serving bowls, so if anything you want to slightly undercook the noodles). Add lime juice, sugar, and salt to broth, tasting and seasoning as needed (you may need more or less salt depending on how salty your broth was to begin with). 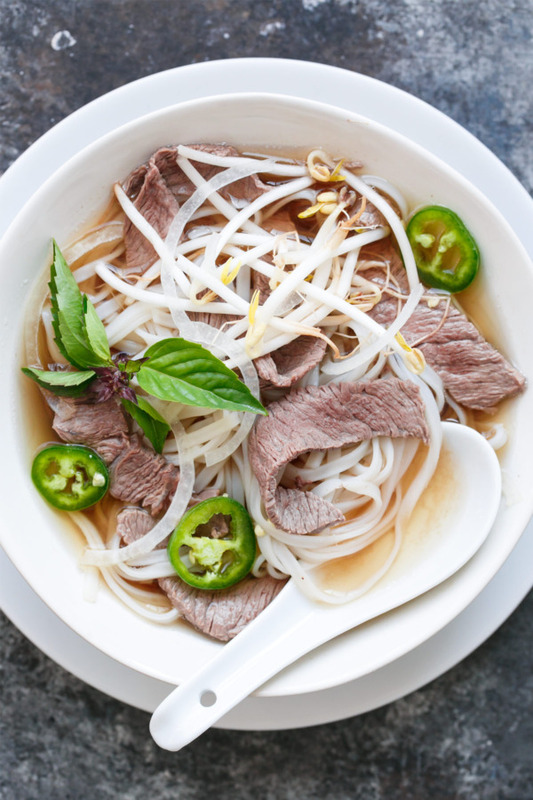 Submerge thinly sliced beef into boiling broth, where it will cook in approximately 10 to 20 seconds. Spoon into serving bowls over noodles. Garnish with bean sprouts, onion, jalapeno, and basil leaves. Serve with hoisin and sriracha. Tip: Slicing beef into super thin slices is often easier if the beef is slightly frozen (freeze 30 minutes to 1 hour before slicing).